The little brother of the Nokia E71, the Nokia E63 lacks a GPS receiver and preinstalled games, and it has a downgraded camera. 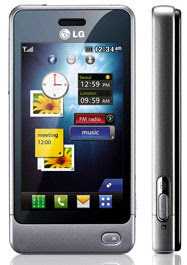 On the other hand, it possesses the same excellent email and messaging capabilities as other members of the Nokia E-series. And the biggest news here: the E63 sells for less than 10K. The Nokia 5233 proves that just because a phone’s price tag doesn’t cross over into five figures, doesn’t mean it cannot stand on its own. The 5233 might not have all the features under the sun but it’s still a very good phone. Alright, you have a modest budget and desire more than just a lame excuse for a phone? Good news: the new Nokia 6303 Classic is just what the doctor ordered. It is good looking, offers a nice clean interface, and has a decent feature set for the price. 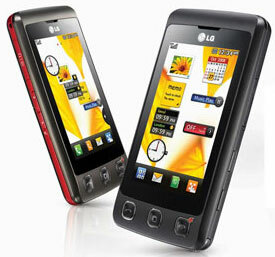 The LG Cookie Pep is an affordable touchscreen phone with a usable UI, good looks and good performance. LG knows exactly what it’s doing with the Cookie Pep. As expected the Pep has shed a number of features that you would come to expect from more expensive phones. It doesn’t support Wi-Fi or 3G and cannot be used as a GPS device. It has 42MB of internal memory but a microSD card can be used to expand that up to 16GB. A nice addition is the 2GB card that was bundled along with the phone. The Pep has a 3 inch screen that displays a resolution of 240x400 and has an output of 256K colors. It also has a 3.15MP camera but no flash. It uses a microSD port but inexplicably LG have left out the ubiquitous 3.5mm headphones jack. The LG Cookie (also known as the KP 500) is a phone with a noble purpose. It attempts to give users a full-touch interface at an affordable price. It succeeds to an extent by being a light-weight phone with a well-designed interface but also manages to fall short on certain fronts.